Chemical warfare is warfare (and associated military operations) using the toxic properties of chemical substances to kill, injure, or incapacitate an enemy. 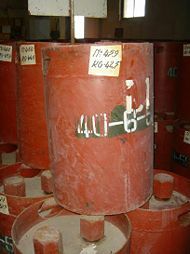 About 70 different chemicals have been used or stockpiled as Chemical Weapons (CW) agents during the twentieth century. The use of these weapons differs from the use of conventional weapons or nuclear weapons because the destructive effects of chemical weapons are not primarily due to any explosive force. Chemical weapons are classified as weapons of mass destruction by the United Nations, and their production and stockpiling were outlawed by the Chemical Weapons Convention of 1993. 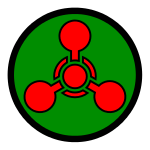 Under this Convention, any toxic chemical, regardless of its origin, is considered a chemical weapon unless it is used for purposes that are not prohibited (an important legal distinction, known as the General Purpose Criterion). The use of nonliving toxic products (such as botulinum toxin, ricin, or saxitoxin) produced by living organisms is considered chemical warfare. On the other hand, the offensive use of living organisms (such as anthrax) is considered biological warfare rather than chemical warfare. Schedule 1 substances: These substances have few, if any, legitimate uses. These may only be produced or used for research, medical, pharmaceutical or protective purposes (that is, testing of chemical weapons sensors and protective clothing). Examples include nerve agents, ricin, lewisite, and mustard gas. The Organization for the Prohibition of Chemical Weapons (OPCW) should be notified of any production of these substances over 100 grams, and a country can have a stockpile of no more than one metric ton of these chemicals. Schedule 2 substances: These substances have no large-scale industrial uses, but may have legitimate small-scale uses. Examples include dimethyl methylphosphonate, a precursor to sarin but also used as a flame retardant, and thiodiglycol, a precursor in the manufacture of mustard gas but also widely used as a solvent in inks. Schedule 3 substances: These substances have legitimate large-scale industrial uses. Examples include phosgene and chloropicrin. Both have been used as chemical weapons, but phosgene is an important precursor in the manufacture of plastics, and chloropicrin is used as a fumigant. Any plant producing more than 30 metric tons per year must be reported to, and can be inspected by, the OPCW. 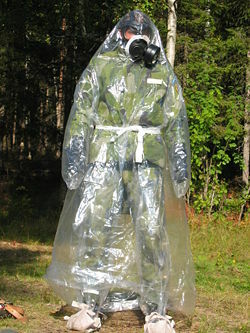 A Swedish Army soldier wearing a chemical agent protective suit (C-vätskeskydd) and his protection mask (skyddsmask 90). Germany, the first side to employ chemical warfare on the battlefield, simply opened canisters of chlorine upwind of the opposing side and let the prevailing winds do the dissemination. Soon after, the French modified artillery munitions to contain phosgene—a much more effective method that became the principal means of delivery. A chemical used in warfare is called a chemical weapon agent (CWA). About 70 different chemicals have been used or stockpiled as chemical weapon agents during the twentieth century and the twenty-first century. These agents may be in liquid, gas or solid form. Liquid agents are generally designed to evaporate quickly; such liquids are said to be volatile or have a high vapor pressure. Many chemical agents are made volatile so they can be dispersed over a large region quickly. The earliest target of chemical weapon agent research was not toxicity, but development of agents that can affect a target through the skin and clothing, rendering protective gas masks useless. In July 1917, the Germans first employed mustard gas, the first agent that circumvented gas masks. Mustard gas easily penetrates leather and fabric to inflict painful burns on the skin. Chemical weapon agents are divided into lethal and incapacitating categories. A substance is classified as incapacitating if less than 1/100 of the lethal dose causes incapacitation, for example, through nausea or visual problems. The distinction between lethal and incapacitating substances is not fixed, but relies on a statistical average called the LD50. Cyanogen chloride/hydrogen cyanide: Cyanide directly prevents cells from utilizing oxygen. The cells then uses anaerobic respiration, creating excess lactic acid and metabolic acidosis. Viruses, bacteria, or other organisms. Their use is classified as biological warfare. World War I saw the earliest implementation of this technique, when German forces at Ypres simply opened cylinders of chlorine and allowed the wind to carry the gas across enemy lines. While simple, this technique had numerous disadvantages. Moving large numbers of heavy gas cylinders to the front-line positions from where the gas would be released was a lengthy and difficult logistical task. Stockpiles of cylinders had to be stored at the front line, posing a great risk if hit by artillery shells. Gas delivery depended greatly on wind speed and direction. If the wind was fickle, as at Loos, the gas could blow back, causing friendly casualties. Gas clouds gave plenty of warning, allowing the enemy time to protect themselves, though many soldiers found the sight of a creeping gas cloud unnerving. Also gas clouds had limited penetration, capable only of affecting the front-line trenches before dissipating. Although it produced limited results in World War I, this technique shows how simple chemical weapon dissemination can be. Shortly after this "open canister" dissemination, French forces developed a technique for delivery of phosgene in a non-explosive artillery shell. This technique overcame many of the risks of dealing with gas in cylinders. First, gas shells were independent of the wind and increased the effective range of gas, making any target within reach of guns vulnerable. Second, gas shells could be delivered without warning, especially the clear, nearly odorless phosgene—there are numerous accounts of gas shells, landing with a "plop" rather than exploding, being initially dismissed as dud high explosive or shrapnel shells, giving the gas time to work before the soldiers were alerted and took precautions. The major drawback of artillery delivery was the difficulty of achieving a killing concentration. Each shell had a small gas payload and an area would have to be subjected to saturation bombardment to produce a cloud to match cylinder delivery. A British solution to the problem was the Livens Projector. This was effectively a large-bore mortar, dug into the ground that used the gas cylinders themselves as projectiles—firing a 14 kg cylinder up to 1500 m. This combined the gas volume of cylinders with the range of artillery. Soviet chemical weapons canisters from a stockpile in Albania. One of the earliest reactions to the use of chemical agents was from Rome. Struggling to defend themselves from the Roman legions, Germanic tribes poisoned the wells of their enemies, with Roman jurists having been recorded as declaring "armis bella non venenis geri," meaning "war is fought with weapons, not with poisons." Before 1915, the use of poisonous chemicals in battle was typically the result of local initiative, and not the result of an active government chemical weapons program. There are many reports of the isolated use of chemical agents in individual battles or sieges, but there was no true tradition of their use outside of incendiaries and smoke. Despite this tendency, there have been several attempts to initiate large-scale implementation of poison gas in several wars, but with the notable exception of World War I, the responsible authorities generally rejected the proposals for ethical reasons. For example, in 1854 Lyon Playfair, a British chemist, proposed using a cyanide-filled artillery shell against enemy ships during the Crimean War. The British Ordnance Department rejected the proposal "as bad a mode of warfare as poisoning the wells of the enemy." According to the testimony of Assistant Secretary of State for Intelligence and Research Carl W. Ford before the Senate Committee on Foreign Relations, it is very probable that China has an advanced chemical warfare program, including research and development, production, and weaponization capabilities. Furthermore, there is considerable concern from the U.S. regarding China's contact and sharing of chemical weapons expertise with other states of proliferation concern, including Syria and Iran. A good example of early chemical warfare was the late Stone Age (10,000 B.C.E.) hunter-gatherer societies in Southern Africa, known as the San. They used poisoned arrows, tipping the wood, bone, and stone tips of their arrows with poisons obtained from their natural environment. These poisons were mainly derived from scorpion or snake venom, but it is believed that some poisonous plants were also utilized. The arrow was fired into the target of choice, usually an antelope (the favorite being an eland), with the hunter then tracking the doomed animal until the poison caused its collapse. The earliest surviving references to toxic warfare are possibly those in the Indian epics Ramayana and Mahabharata. The Manusmriti book of laws also forbids use of poison weapons. Dating from the fourth century B.C.E., writings of the Mohist sect in China describe the use of bellows to pump smoke from burning balls of mustard and other toxic vegetables into tunnels being dug by a besieging army. Even older Chinese writings dating back to about 1000 B.C.E. contain hundreds of recipes for the production of poisonous or irritating smokes for use in war along with numerous accounts of their use. From these accounts we know of the arsenic-containing "soul-hunting fog," and the use of finely divided lime dispersed into the air to suppress a peasant revolt in 178 C.E. The earliest recorded use of gas warfare in the West dates back to the fifth century B.C.E., during the Peloponnesian War between Athens and Sparta. Spartan forces besieging an Athenian city placed a lighted mixture of wood, pitch, and sulfur under the walls hoping that the noxious smoke would incapacitate the Athenians, so that they would not be able to resist the assault that followed. Sparta wasn't alone in its use of unconventional tactics during these wars: Solon of Athens is said to have used hellebore roots to poison the water in an aqueduct leading from the Pleistrus River around 590 B.C.E. during the siege of Cirrha. Chemical weapons were known and used in ancient and medieval China. Polish chronicler Jan Długosz mentions usage of poisonous gas by Mongol army in 1241 in Battle of Legnica. In the seventeenth century during sieges, armies attempted to start fires by launching incendiary shells filled with sulphur, tallow, rosin, turpentine, saltpeter, and/or antimony. Even when fires were not started, the resulting smoke and fumes provided a considerable distraction. Although their primary function was never abandoned, a variety of fills for shells were developed to maximize the effects of the smoke. In 1672, during his siege of the city of Groningen, Christoph Bernhard van Galen (the Bishop of Münster) employed several different explosive and incendiary devices, some of which had a fill that included belladonna, intended to produce toxic fumes. Just three years later, on August 27, 1675, the French and the Germans concluded the Strasbourg Agreement, which included an article banning the use of "perfidious and odious" toxic devices. 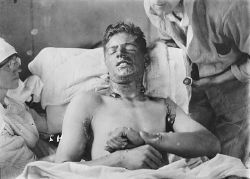 A soldier with mustard gas burns, c. 1917–1918. The French were the first to use chemical weapons during the First World War, using tear gas. The first full-scale deployment of chemical weapon agents was during World War I, originating in the Second Battle of Ypres, April 22, 1915, when the Germans attacked French, Canadian and Algerian troops with chlorine gas; they attacked again two days later with the combined total of deaths estimated at 5,000. A total 50,965 tons of pulmonary, lachrymatory, and vesicant agents were deployed by both sides of the conflict, including chlorine, phosgene and mustard gas. Official figures declare about 1,176,500 non-fatal casualties and 85,000 fatalities directly caused by chemical weapon agents during the course of the war. To this day unexploded WWI-era chemical ammunition is still frequently uncovered when the ground is dug in former battle or depot areas and continues to pose a threat to the civilian population in Belgium and France and less commonly in other countries. The French and Belgian governments have had to launch special programs for treating discovered ammunition. After the war, most of the unused German chemical weapon agents were dropped into the Baltic Sea, a common disposal method among all the participants in several bodies of water. Over time, the salt water causes the shell casings to corrode, and mustard gas occasionally leaks from these containers and washes onto shore as a wax-like solid resembling ambergris. Even in this solidified form, the agent is active enough to cause severe contact burns to anybody coming into contact with it. Following the defeat of the Ottoman Empire in 1917, the Ottoman government collapsed completely, and the former empire was divided amongst the victorious powers in the Treaty of Sèvres. The British occupied Mesopotamia (present-day Iraq) and established a colonial government. In 1920, the Arab and Kurdish people of Mesopotamia revolted against the British occupation, which cost the British dearly. As the Mesopotamian resistance gained strength, the British resorted to increasingly repressive measures. Much speculation was made about aerial bombardment of major cities with gas. In the 1920s, generals reported that poison had never won a battle. The soldiers said they hated it and hated the gas masks. Only the chemists spoke out to say it was a good weapon. In 1925, sixteen of the world's major nations signed the Geneva Protocol, thereby pledging never to use gas in warfare again. Notably, in the United States, the Protocol languished in the Senate until 1975, when it was finally ratified. The Soviet Union also employed poison gas on its own people in 1921 during peasant Tambov Rebellion. An order signed by military commanders Tukhachevsky and Vladimir Antonov-Ovseenko stipulated: "The forests where the bandits are hiding are to be cleared by the use of poison gas. This must be carefully calculated, so that the layer of gas penetrates the forests and kills everyone hiding there." In 1935, Fascist Italy used mustard gas during the invasion of Ethiopia in the Second Italo-Abyssinian War. Ignoring the Geneva Protocol, which it signed seven years earlier, the Italian military dropped mustard gas in bombs, sprayed it from airplanes, and spread it in powdered form on the ground. 15,000 chemical casualties were reported, mostly from mustard gas. Despite article 171 of the Versailles Peace Treaty and a resolution adopted against Japan by the League of nations on May 14, 1938, the Imperial Japanese Army frequently used chemical weapons. By fear of retaliation however, those weapons were never used against Occidentals but against other Orientals judged "inferior" by the imperial propaganda. According to historians Yoshiaki Yoshimi and Seiya Matsuno, the chemical weapons were authorized by specific orders given by Emperor Showa himself, transmitted by the chief of staff of the army. For example, the Emperor authorized the use of toxic gas on 375 separate occasions during the battle of Wuhan from August to October 1938. They were also heavily used during the invasion of Changde. The Imperial Japanese Army used mustard gas and the blister agent Lewisite against Chinese troops and guerrillas during the Sino-Japanese War (1937-1945). During these attacks, the Japanese also employed biological warfare by intentionally spreading cholera, dysentery, typhoid, bubonic plague, and anthrax produced by Unit 731. Experiments involving chemical weapons were conducted on live prisoners (Unit 731 and Unit 516). As of 2005, 60 years after the end of the war, canisters abandoned by Japan in their hasty retreat were still being dug up in construction sites, causing injuries and allegedly even deaths. During World War II, chemical warfare was revolutionized by Nazi Germany's accidental discovery of the nerve agents tabun and sarin by Gerhard Schrader, a chemist of IG Farben. The nerve agent soman was discovered by Nobel Prize laureate Richard Kuhn and his collaborator Konrad Henkel at the Kaiser Wilhelm Institute for Medical Research in Heidelberg in spring of 1944 (Schmaltz 2005; Schmaltz 2006). The Nazis developed and manufactured large quantities of several agents, but chemical warfare was not extensively used by either side though chemical troops were set up (in Germany since 1934) and delivery technology was actively developed. Recovered Nazi documents suggest that German intelligence incorrectly thought that the Allies also knew of these compounds, interpreting their lack of mention in the Allies' scientific journals as evidence that information about them was being suppressed. Germany ultimately decided not to use the new nerve agents, fearing a potentially devastating Allied retaliatory nerve agent deployment. On the night of December 2, 1943, German Ju-88 bombers attacked the port of Bari in Southern Italy, sinking several American ships—among them John Harvey, which was carrying mustard gas intended for use in retaliation by the Allies if German forces initiated gas warfare. The presence of the gas was highly classified, and authorities ashore had no knowledge of it—which increased the number of fatalities, since physicians, who had no idea that they were dealing with the effects of mustard gas, prescribed treatment improper for those suffering from exposure and immersion. The whole affair was kept secret at the time and for many years after the war (in the opinion of some, there was a deliberate and systematic cover-up). According to the U.S. military account, "Sixty-nine deaths were attributed in whole or in part to the mustard gas, most of them American merchant seamen," out of 628 mustard gas military casualties. The large number of civilian casualties among the Italian population were not recorded. Part of the confusion and controversy derives from the fact that the German attack was highly destructive and lethal in itself, also apart from the accidental additional effects of the gas (it was nicknamed "The Little Pearl Harbor"), and attribution of the causes of death between the gas and other causes is far from easy. The affair is the subject of two books: Disaster at Bari by Glenn B. Infield and Nightmare in Bari: The World War II Liberty Ship Poison Gas Disaster and Coverup by Gerald Reminick. In 1944, the Grand Mufti of Jerusalem, Amin al-Husayni, the senior Islamic religious authority of the Palestinian Arabs and close ally of Adolf Hitler, sponsored an unsuccessful chemical warfare assault on the Jewish community in Palestine. Five parachutists were supplied with maps of Tel Aviv, canisters of a German–manufactured "fine white powder," and instructions from the Mufti to dump chemicals into the Tel Aviv water system. District police commander Fayiz Bey Idrissi later recalled, "The laboratory report stated that each container held enough poison to kill 25,000 people, and there were at least ten containers." During the Holocaust, the Nazis used the insecticide Zyklon B, which contains hydrogen cyanide, to kill several million people in extermination camps such as Auschwitz and Majdanek. Tear and reportedly poison gasses were used by against civilian and guerilla shelters during the Warsaw Ghetto Uprising in 1943, and again against sewer lines of communication during the Warsaw Uprising in 1944. In the concentration camp Struthof-Natzweiler in occupied Alsace the German physicians August Hirt and Otto Bickenbach conducted human experiments with mustard gas and phosgene on inmates to test possible prophylactic and therapeutic treatments causing injuries and death of many prisoners. In 1952, researchers in Porton Down, England, invented the VX nerve agent but soon abandoned the project. In 1958, the British government traded their VX technology with the United States in exchange for information on thermonuclear weapons; by 1961, the U.S. was producing large amounts of VX and performing its own nerve agent research. This research produced at least three more agents; the four agents (VE, VG, VM, VX) are collectively known as the "V-Series" class of nerve agents. Also in 1952 the U.S. Army patented a process for the "Preparation of Toxic Ricin," publishing a method of producing this powerful toxin. During the 1960s, the U.S. explored the use of anticholinergic deleriant incapacitating agents. One of these agents, assigned the weapon designation BZ, was allegedly used experimentally in the Vietnam War. These allegations inspired the 1990 fictional film, Jacob's Ladder. On April 19, 1993, the FBI injected non-lethal CS grenades into wooden buildings during the Waco Siege. None of the Davidians left their building, however. CS is flammable and may have helped fuel the fires that started later. All the buildings within the site burned to the ground, but a few members tried to escape. Approximately 60,000 [U.S.] military personnel were used as human subjects in the 1940s to test the chemical agents mustard gas and lewisite. Between the 1950s through the 1970s, at least 2,200 military personnel were subjected to various biological agents, referred to as Operation Whitecoat. Unlike most of the studies discussed in this report, Operation Whitecoat was truly voluntary. Between 1951 and 1969, Dugway Proving Ground was the site of testing for various chemical and biological agents, including an open air aerodynamic dissemination test in 1968 that accidentally killed, on neighboring farms, approximately 6,400 sheep by an unspecified nerve agent. According to Mirzayanov, the Soviets also developed agents that were safer to handle, leading to the development of the so-called binary weapons, in which precursors for the nerve agents are mixed in a munition to produce the agent just prior to its use. Because the precursors are generally significantly less hazardous than the agents themselves, this technique makes handling and transporting the munitions a great deal simpler. Additionally, precursors to the agents are usually much easier to stabilize than the agents themselves, so this technique also made it possible to increase the shelf life of the agents a great deal. During the 1980s and 1990s, binary versions of several Soviet agents were developed and are designated as "Novichok" agents (after the Russian word for "newcomer"). Together with Lev Fedorov, he told the secret Novichok story exposed in the newspaper Moscow News. The Iran-Iraq War began in 1980, when Iraq attacked Iran. Early in the conflict, Iraq began to employ mustard gas and tabun delivered by bombs dropped from airplanes; approximately 5 percent of all Iranian casualties are directly attributable to the use of these agents. About 100,000 Iranian soldiers were victims of Iraq's chemical attacks. Many were hit by mustard gas. The official estimate does not include the civilian population contaminated in bordering towns or the children and relatives of veterans, many of whom have developed blood, lung, and skin complications, according to the Organization for Veterans. Nerve gas agents killed about 20,000 Iranian soldiers immediately, according to official reports. Iraq also targeted Iranian civilians with chemical weapons. Many thousands were killed in attacks on populations in villages and towns, as well as front-line hospitals. Many still suffer from the severe effects. Shortly before war ended in 1988, the Iraqi Kurdish village of Halabja was exposed to multiple chemical agents, killing about 5,000 of the town's 50,000 residents. After the incident, traces of mustard gas and the nerve agents sarin, tabun and VX were discovered. While it appears that Iraqi government forces are to blame, some debate continues over the question of whether Iraq was really the responsible party, and whether this was a deliberate or accidental act. Technically, the employment of tear gas by Argentine forces during the 1982 invasion of the Falkland Islands constitutes chemical warfare. However, the tear gas grenades were employed as nonlethal weapons to avoid British casualties. (In the hope that Britain would more easily accept the loss of territory in the conflict.) The barrack buildings the weapons were used on proved to be deserted in any case. Some political commentators dispute the practicality of chemical and biological weapons as tools of terrorism, however, stating that the effective use of such weapons is much more difficult than the use of conventional explosives, and that they are more useful in the fear that they generate. In July of 1974, a group calling themselves the Aliens of America successfully firebombed the houses of a judge, two police commissioners, and one of the commissioner’s cars, burned down two apartment buildings, and bombed the Pan Am Terminal at Los Angeles International Airport, killing three people and injuring eight. The organization, which turned out to be a single resident alien named Muharem Kurbegovic, claimed to have developed and possessed a supply of sarin, as well as 4 unique nerve agents named AA1, AA2, AA3, and AA4S. Although no agents were found at the time he was arrested in August of 1974, he had reportedly acquired "all but one" of the ingredients required to produce a nerve agent. A search of his apartment turned up a variety of materials, including precursors for phosgene and a drum containing 25 pounds of sodium cyanide. In 2001, after carrying out the attacks in New York City on September 11, the organization Al Qaeda announced that they were attempting to acquire radiological, biological, and chemical weapons. This threat was lent a great deal of credibility when a large archive of videotapes was obtained by the cable television network CNN in August of 2002 showing, among other things, the killing of three dogs by an apparent nerve agent. In early 2007 multiple terrorist bombings have been reported in Iraq using chlorine gas. These attacks have wounded or sickened more than 350 people. United Nations Secretary-General Ban Ki Moon condemned the attacks as, "clearly intended to cause panic and instability in the country." ↑ Will Irwin, The Use of Poison Gas, New York Tribune, April 22, 1915. Retrieved April 16, 2018. ↑ Michael Bothe, Natalino Ronzitti, Allan Rosas, The New Chemical Weapons Convention—Implementation and Prospects (Boston, MA: Martinus Nijhoff Publishers, ISBN 9041110992). ↑ Harry Salem and Sidney A. Katz (eds. ), Inhalation Toxicology (CRC Press, 2016, ISBN 978-1138033665). ↑ Nicolas Werth, Karel Bartošek, Jean-Louis Panné, Jean-Louis Margolin, Andrzej Paczkowski, Stéphane Courtois, The Black Book of Communism: Crimes, Terror, Repression (Cambridge, MA: Harvard University Press, 1999, ISBN 0674076087). ↑ WWII German Chemical Warfare Plans Released after 72 Years of Secrecy Webwire, June 24, 2011. Retrieved April 16, 2018. ↑ Eric Niderost, World War II: German Raid on Bari. History Net, June 12, 2006. Retrieved April 16, 2018. ↑ Benyamin Korn, Arab Chemical Warfare Against Jews—in 1944, The David S. Wyman Institute for Holocaust Studies. Retrieved April 16, 2018. ↑ 8.0 8.1 8.2 8.3 Is Military Research Hazardous to Veterans' Health? Gulf War.web, December 8, 1994. Retrieved April 16, 2018. ↑ Yevgenia Albats and Catherine A. Fitzpatrick, The State Within a State: The KGB and Its Hold on Russia—Past, Present, and Future (New York, NY: Farrar, Straus, Giroux, 1994, ISBN 0374181047). ↑ Lev Fedorov, Chemical Weapons in Russia: History, Ecology, Politics, Center of Ecological Policy of Russia. Retrieved April 16, 2018. ↑ Vadim J. Birstein, The Perversion Of Knowledge: The True Story of Soviet Science (New York, NY: Westview Press, 2004, ISBN 0813342805). ↑ Lev Fedorov and Vil Mirzayanov, "A Poisoned Policy," Moscow News (1992) 39. ↑ Ramesh C. Gupta (ed. ), Handbook of Toxicology of Chemical Warfare Agents (Academic Press, 2015, ISBN 978-0128001592). ↑ Simon Wessely, Weapons of mass hysteria. Guardian Book Review, October 19, 2001. Retrieved April 16, 2018. ↑ MSNBC, T Is for Terror Newsweek Inc., July 9, 2003. Retrieved April 16, 2018. ↑ UN News Centre, Secretary-General condemns terrorist chlorine bombings in Iraq. March 19, 2007. Retrieved April 16, 2018. Brophy, Leo P., and George J. B. Fisher. The Chemical Warfare Service: Organizing for War. Office of the Chief of Military History, 1959. Brophy, L.P., W.D. Miles, and C.C. Cochrane. The Chemical Warfare Service: From Laboratory to Field, 1959. Burck, Gordon M., and Charles C. Flowerree. International Handbook on Chemical Weapons Proliferation. Westport, CT: Greenwood Press, 1991. ISBN 0313276439. Chomsky, Noam. "Prospects for Peace in the Middle East". Counter Currents, 2001. Retrieved April 16, 2018. Croddy, Eric. Chemical and Biological Warfare. Katlenburg-Lindau, DE: Copernicus, 2001. ISBN 0387950761. E-Medicine. Chemical Warfare. E-Medicine. Retrieved April 16, 2018. GulfWeb. The Riegle Report. United States Senate, 103d Congress, 2d Session. Retrieved April 16, 2018. Haber, L.F. The Poisonous Cloud: Chemical Warfare in the First World War. New York, NY: Oxford University Press, 1986. ISBN 0198581424. Hammond, James W. Jr. Poison Gas: The Myths Versus Reality. Westport, CT: Greenwood Press, 1999. ISBN 0313310386. Heller, Charles E. Chemical Warfare in World War I: The American Experience, 1917–1918. Fort Leavenworth, Combat Studies Institute, U.S. Army Command and General Staff College, 1984. Johnson, Jeffrey Allan. The Kaiser's Chemists: Science and Modernization in Imperial Germany. Chapel Hill, NC: University of North Carolina Press, 1990. ISBN 0807819026. Kleber, B.E. and D. Birdsell. The Chemical Warfare Service in Combat. Official US history, 1966. Korn, Benyamin. Arab Chemical Warfare Against Jews – in 1944. The David S. Wyman Institute for Holocaust Studies, 2003. Retrieved April 16, 2018. Morel, Benoit, and Kyle Olson. Shadows and Substance: The Chemical Weapons Convention. Boulder, CO: Westview Press, 1993. ISBN 0813387353. MSNBC. T Is for Terror. Retrieved February 20, 2017. Schmaltz, Florian. Schmaltz: Neurosciences and Research on Chemical Weapons of Mass Destruction in Nazi Germany. Journal of the History of the Neurosciences. 15 (2006):186–209. Timmerman, Kenneth R. Death Lobby: How the West Armed Iraq. Boston, MA: Houghton Mifflin, 1991.ISBN 0395593050. Tucker, Jonathan B. Chemical Warfare From World War I to Al-Qaeda. New York, NY: Anchor, 2006. ISBN 1400032334. Agency for Toxic Substances and Disease Registry. US Department of Health and Human Services. Potential Military Chemical/Biological Agents and Compounds. United States Department of Defense. Russian Biological and Chemical Weapons, about the danger posed by non-state weapons transfers. Iranian Chemical Attacks Victims (Payvand News Agency). 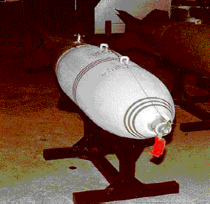 Chemical Weapons stored in the United States. Fedorov, Lev. 1994. Chemical Weapons in Russia: History, Ecology, Politics. Moscow, Center of Ecological Policy of Russia. This page was last modified on 16 April 2018, at 22:43.